A few of my friends are getting back into the game, and subsequently began denying my due entitlement as local king. So, now armed with a debit card and real money, I am prepared to make the final push to finish my long-favorite deck. I'm going to buy a set of Asceticism. Now, on to the deck. My last working model for 6Sams comes from early 2015, back in those last bright years before the dark clout of pendulums muddied the game beyond redemption. Needless to say, it's time for a major remodel. For once, I can listen to advice and order things, so here goes. What does it need to function in the brave new world of Link Summoning? First of all, it was never Pendulums that "muddled" the game, but gradual powercreep. Pendulums were a completely fine. But enough of that. 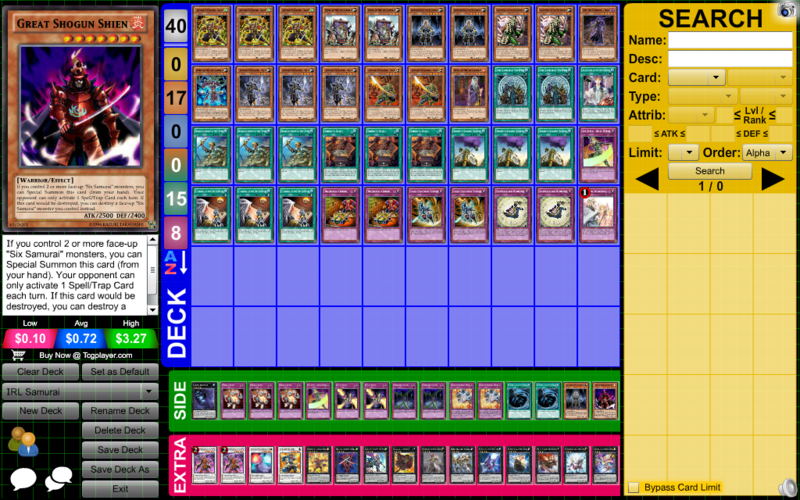 The real threats are current strongest decks, all of which are much much stronger than Six Samurai ever were. The OCG has Gateway at 3, and Six Samurai are just barely playable. You need to be able to go against Zoodiac, which has insane disruption and can plus heavily off 1 card, True Draco, which has a card stronger than Apoqliphort Towers, Dinosaurs, which can make a wide variety of threats including, but not limited to, themed solemn judgement, Naturia Beast, one sided Skill Drain on legs, and Book of Eclipse with no downsides, on legs. Also notable are a one card indestructible Crystal Wing Synchro Dragon, and an extremely strong consistent draw engine. Expect these to be mixed and matched for maximum effectiveness. So how does Six Samurai survive? It doesn't, on its own. Their new support is underwhelming, so you either have a true king variant w/ Master Peace and True King Lithosagym, the Disaster, or get Gateway at 3 and summon as many Firewall Dragons as possible. If you intend to come back into the game fully, you will want to completely drop Six Samurai in favor of Dinos, they have a structure deck recently released. Just add Lithosagym and you have a strong deck. If you intend to screw around with friends, just be warned that basically everything you knew has been replaced. For simulators, www.duelingbook.com is the new reincarnation of Dueling Network, and has Links. YGOPro Percy's download links can be found in their discord, but does not have links. DevPro is still around, and also does not have links. The Dawn of a New Era has links, but is not as clean as the other simulators. Also Worlds is this weekend. Maybe watch a little, see how the game changed.